Adequate communication is essential to real estate companies to ensure truthful, accurate information exchange and enables to do morally-correct decision making. Real Estate companies need to give consideration to how they communicate and remain lawful in their day-to-day business activities. Therefore, communication in situations that involve legal complications, request extra attention. Using our easy-to-modify (e.g. visuals, typography, etc) Commercial Rental Application Letter can make a huge difference and a great fit for your needs. Our trustworthy real estate templates are all crafted and screened by professionals in the industry that have experience in special law-related fields and are actively involved in legal issues around the topic. 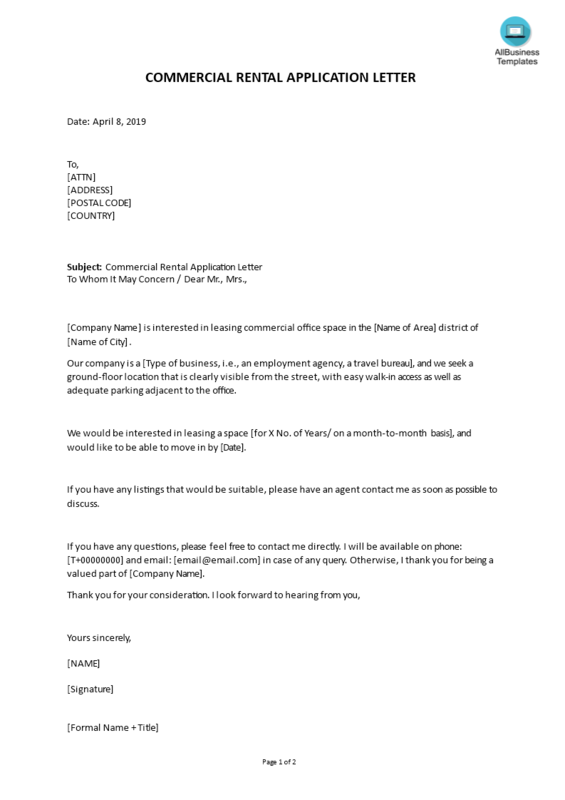 This Commercial Rental Application Letter template covers the most important subjects and will help you to structure and communicate in a professional way with those involved. Find any real estate business or legal form you need, and let your word processor help you write it quickly. Download this professional real estate Commercial Rental Application Letter in Word template if you find yourself in this situation and save yourself time, efforts and possibly reduce the lawyer-fees! Using our real estate and business document templates will help you to deal with every applicable situation! These document templates will help you dealing with legal matters as well. However, we still recommend considering local legal support in case you have any doubts. [Company Name] is interested in leasing commercial office space in the [Name of Area] district of [Name of City]. Our company is a [Type of business, i.e., an employment agency, a travel bureau], and we seek a ground-floor location that is clearly visible from the street, with easy walk-in access as well as adequate parking adjacent to the office..